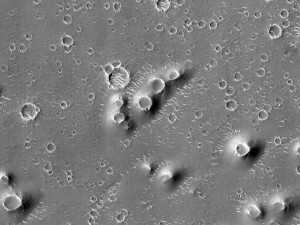 A field of pitted cones in Utopia Planitia on Mars, as observed by the HiRISE instrument onboard the Mars Reconnaissance Orbiter. Taken from http://beautifulmars.tumblr.com/post/82817530060/field-of-cones-in-utopia-planitia. A visit from a planetary sciences colleague this weekend got me excited again about automated feature identification for remote-sensing imagery. 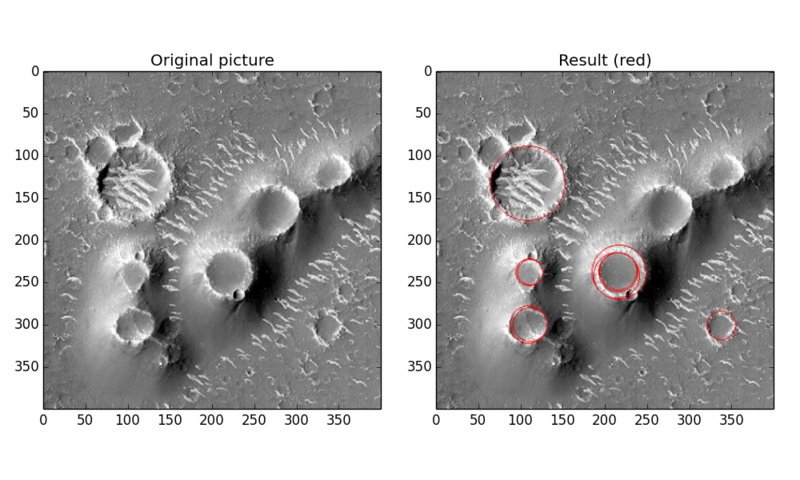 This colleague and I talked about her work on Martian pitted cones (examples shown at left). These small hills form when a basalt flow passes over volatile (i.e., water) deposit, heating it and producing a steam explosion that uplifts the flow into a cone shape with a crater at the apex. As for the vast majority of geomorphological studies, pitted cones on Mars are identified by groups of dedicated researchers, sifting by hand through hundreds or thousands of high-resolution images. If, instead, identification could be automated, it would help realize dramatic savings in person-hours and probably significantly increase the number of known features. It could also mitigate potential observational biases introduced by human image processing. As an experiment, I applied algorithms from the scikit-image python package to find pitted cones in the example image shown at left. Fortunately, the documentation already provides a good example of circular feature detection. So modifying the example code, I applied it to a small portion of the example image, and the figure below shows the results. Here I’m just showing the top ten most strongly detected circular features. Unfortunately, the algorithm is not perfect — some of the obvious cones were not picked out, and others were highlighted more than once. But overall, not terrible, considering it took me about an hour and a half to implement (which included upgrading to Python 3 via the Anaconda package because scikit-image wouldn’t work with the Enthought Python version 2.7 — this upgrade will probably adversely affect my ability to use astroml, by the way). The example code only returns the top two most strongly detected features for each circle radius it tries; this restriction would be simple to remove. The fact that the pitted cones are cone-shaped means you could require that any putative crater be framed by an appropriately shaped shadow. Regardless of the cone’s actual height (probably unknown anyway), the shadow on the cone should darken as the solar incident angle approaches 180 degrees, modulo any nearby morphological features (as evident in the figure below). My attempt to automatically identify pitted cones using scikit-image.